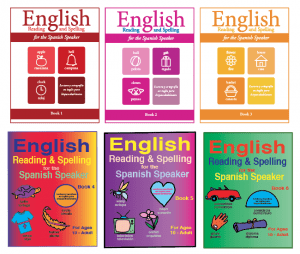 You can now download Fisher Hill’s English Reading and Spelling for the Spanish Speaker series. This series contains six workbooks. English Reading and Spelling for the Spanish Speaker was written to help students learn how to read and spell in English. It uses a systematic approach to teach the English speech sounds and provides practice with phonemic awareness, which is the ability to identify individual sounds and their order within words. Learning the different speech sounds will help students read and write fluently in English. Eighty-five percent (85%) of words in English are phonetic. This series also presents many of the small, commonly used words, called sight words, that are not phonetic. The series is bilingual because the word list for each lesson is presented in English and Spanish. There are pictures to go with many of the words in the lists. Each lesson emphasizes one or two new speech sounds. Vowel sounds in English are different from those in Spanish, but many of the English consonant sounds are similar to the ones in Spanish. Each lesson’s word list begins with words that contain the speech sound that is being emphasized in that lesson. The last word or words in the list are sight words. Practicing English speech sounds, sight words, and their spellings will help students learn to read and spell fluently in English. Fisher Hill’s workbooks provide lessons that are not overwhelming to students. The workbooks are explicit, systematic and very structured. Students like the workbooks because the pace is reasonable, print is large, directions are in Spanish, there are many pictures, but the content is for older students and adults. Teachers like our books because everything is ready to go! There’s an answer key at the end of each lesson. The workbooks are geared toward Spanish-speaking teens and adults but students who speak another language can benefit from using these books because the series is to teach students reading and spelling in English. There is an English translation of the Spanish directions at the end of each book. Visit our website at www.Fisher-Hill.com to learn more about the series English Reading and Spelling for the Spanish Speaker. Sample pages from each workbook can be viewed from our website.